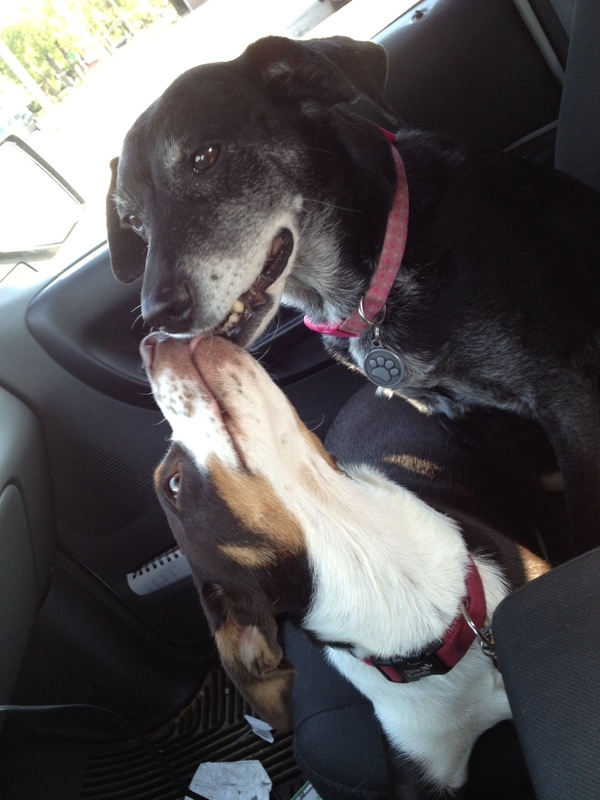 Charlie and Lex celebrate a seat up front on the ride home from Camp Bow Wow. It’s only been six days, and I hardly recognize Charlie. In the time he and Lex stayed at Camp Bow Wow, Charlie grew almost to Lexie’s height. This, after gaining only 1 pound in the first month we had him. Matt and I slip away to Florida, and he experienced a massive growth spurt. All of this fades away when I crouch down and pull Charlie into my arms. He wiggles and writhes, melting into a bumbling mess of puppy kisses. Charlie hops off my lap and slides next to Matt on the couch. He nuzzles Matt’s ear, and Matt gives in, pulling him closer. Oh yes, I think I recognize this pup. How could I mistake his gentle energy? His uncanny ability to love his way into forbidden territory on the couch? Lex comes in close, and I lean down only to be intercepted by her gaping mouth boinking off my nose. I’m not sure about this move, but in recent months she’s taken to this awkward show of affection. I silently wonder if it’s a symptom of her dementia. She looks good, her eyes seem clearer than usual. And her energy level defies her 14 years; she even tries to play with one of Charlie’s tennis balls. Matt said the reunion at Camp Bow Wow was emotional, with Lexie jumping up in his lap, then spinning in circles. It’s hard for me to imagine her this excited, but I take Matt at his word. Getting them in the truck was a bit of work (Lex missed on her first try, and tangled her legs in the running board) but once they were in they staked out a spot in the front seat. They say absence makes the heart grow fonder, and it also must make the memory grow fainter. The dogs are supposed to ride in the back seat, but Matt allowed them to ride up front for the entire 15-minute ride home. Knowing this was a special occasion, they behaved, and slipped in a few puppy kisses. I totally know these pups. How could I be mistaken? Upon returning, Charlie would sniff out the front room, then grab his favorite plushie toy from his toy box. And Lex would hop into her favorite spot on the couch. Matt placed their beds back in the bedroom, marveling at how they were returned in one piece (well, almost). He would later boast about how the staff members at Camp Bow Wow said goodbye to the pups, and how they told him the dogs were model campers. Awwe, proud mama alert. Yes, I know these dogs. This entry was posted in Woof! and tagged adopt, aging, boarding, border collie, dementia, dog, pets, puppy, rescue, vacation by ourfureverfamily. Bookmark the permalink.